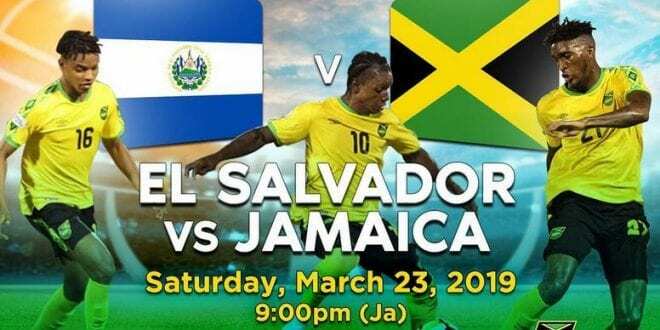 Even though Jamaica has been the better team over the last 5 years when the 2 meat, the last match between the Reggae boyz and El Salvadora end 1-1 and with the fact that El Salvador will be playing at home, the Reggae Boyz are expecting a tough encounter tonight. Jamaica is playing to qualify for League A of the Nation’s League, the Reggae Boyz will need to finish in the top 6, However a top 10 finish will get them into the much prized Gold Cup. Also this match and others that are forthcoming will serve as needed preparation before Fifa World Cup qualifiers for 2022 are started. Head coach Theodore Whitmore is expected to start the following players: Andre Blake, Alvas Powell, Ladale Richie, Damion Lowe, Kemar Lawrence, Michael Hector, Shaun Francis, Peter-Lee Vassell, Darren Mattocks, Cory Burke and Maalique Foster. Back in 2017 Mr. Whitmore took the Boyz to the final of the Concacaf Gold Cup, with mainly locally born players. Over 90% of Jamaica’s current squad was born locally, big change up from back in the days with the team was filled with overseas born players, mainly UK. See picture below of The Reggae Boyz in Training. El Salvador vs Jamaicawill football match today will be be played in San Salvador, El Salvador this evening at 9 o’clock, Jamaica time. The Jamaica reggae boyz national football team went to Barbados for a summer friendly where the game ended in stalemate vs the home side. After going down 2-0 in th first half Jamaica fought back to complete the entertaining match 2-2. Its noted that the reggae boyz played the more attractive football however was less clinical when in front of the goal. Having missed a penalty in the 48th-minute Jamaica still managed to pull one back with 10 minutes remaining, the boyz then finally pulled level on the 86th-minute via a spot kick from Vassell, unquestionably Jamaica’s most impressive player on the field. Jamaican Football players, the Reggae Boyz are no longer in FIFA’s top 50 teams worldwide. Even though they are still the highest ranked team in the Caribbean and they are ranked fourth in CONCACAF. In what was a 2 leg encounter the Jamaica Reggae Girlz have manage to end both match with a win, the girls played an entertaining match of Football finding the back of the net 2 times, 2 goals from Khadija ‘Bunny’ Shaw and another from talented 16-year-old Jody Brown which turned out to be the game winner after Chile managed to score 2 goals of their own.